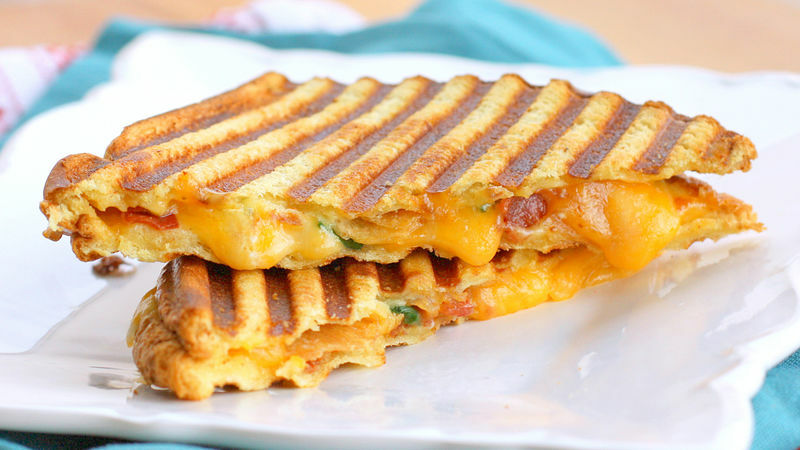 Heat panini grill and brush with olive oil. Butter the outside of both sides of the bread. Turn bread over and lather the inside of the bread with the sour cream. 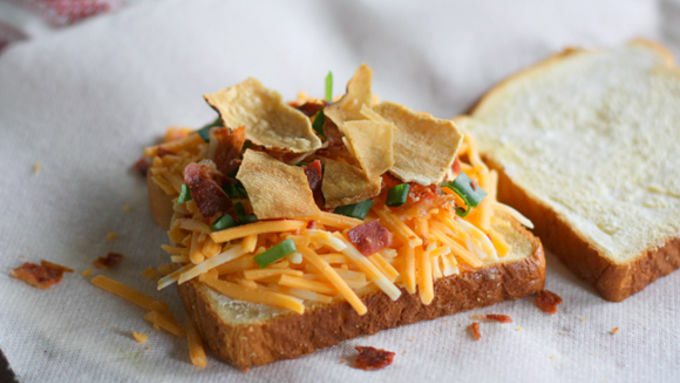 On one piece of the sour cream-lathered bread, pile on your cheese, bacon, green onions, and potato chips. Top with the other piece of bread and place in the panini maker. Close the top and cook for 2-3 minutes or until golden brown. Slice in half and enjoy! 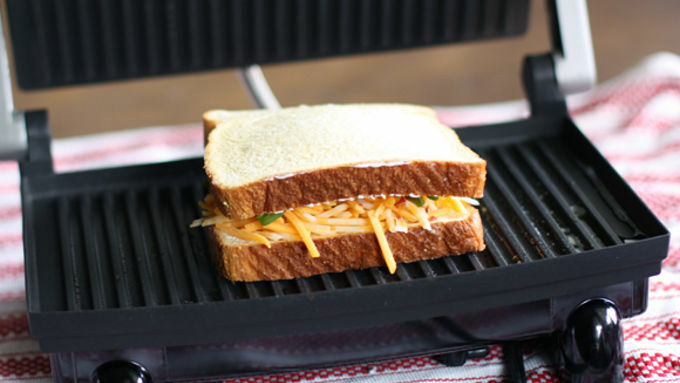 Stove top instructions: Don't worry if you don't have a panini maker, you can make this on the stove no problem. In college I worked at a local restaurant waiting tables, and we had to plate the main entree and side before serving it to our customers. Our most popular side was a loaded baked potato. We were required to assemble the baked potatoes in a certain order: cheese, (first – so it would melt), butter, sour cream, bacon and green onions. Imagine me repeating this in my head a hundred times in my head every night so that I didn't mess it up. I have it burned into my brain even now. Even with seeing hundreds of them a night, loaded bakers are still one of my favorite indulgences! This Loaded Baked Potato Grilled Cheese Sandwich combines not one, but two of my favorite comfort foods. It's all of your favorite baked potato fixings times two, melted in between two pieces of potato bread. 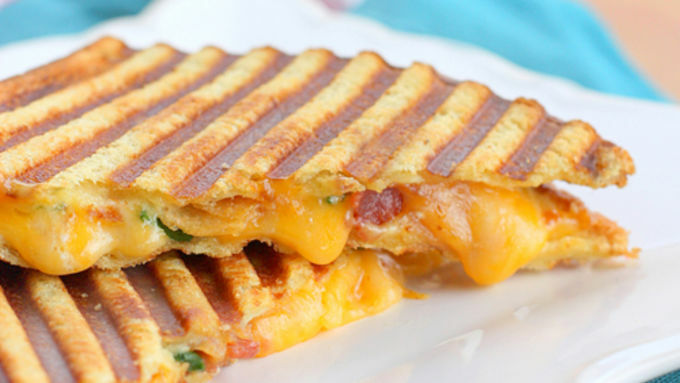 If you don't own a panini maker, no worries! You can cook the sandwich in a skillet with some melted butter for a couple minutes per side and get the same result. Look at that melted cheese. Don't you just want to dive in? One potato, two potato, three potato, four. You'll need all the potatoes to make these loaded baked potato recipes.